The current CIA director reportedly played on Donald Trumps emotions to persuade him to expel dozens of Russian diplomats, using pictures of dead ducks and sick children that she said were under influence of the Novichok. There are now questions over whether Trump was not only emotionally manipulated by a senior member of his own spy agency, but also whether he was shown misinformation or misleading material in order to take get him to take more hostile actions against Russia. It’s suggested that Haspel resorted to playing on the emotions of Trump because he was reluctant to agree to London’s request to expel diplomats. He reportedly regarded the Salisbury poisoning as “legitimate spy games”, although Moscow denies any responsibility for what happened to former Russian spy Sergei Skripal and his daughter Yulia. 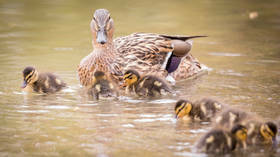 The children had fed ducks with the former spy on the day he was discovered unconscious on a park bench, but there was no evidence of exposure to poisonous substances in any of them and they were sent home. Published on Wed, 17 Apr 2019 15:47:37 GMT, © All rights reserved by the publisher.